At 0120 GMT on Saturday June 3rd ReVision II is at position 03 Degrees 11 Minutes South and 97 Degrees 55 Minutes West. We have had perfect conditions for sailing during the last couple of days and are now moving along very comfortably after a slow start. The weather is calm and sunny with blue skies. We are keeping in close contact with friends who are crossing at the same time. Nick and Ellen on Kika are 100 miles or so in front of us and we have been talking to them twice a day- They had a pod of pilot whales with them today. 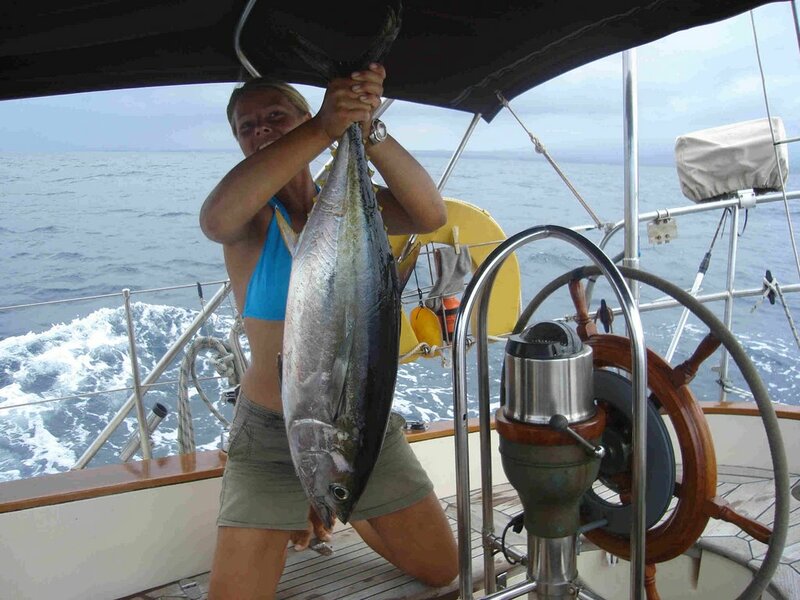 Meanwhile we are still working our way through the Tuna we caught. 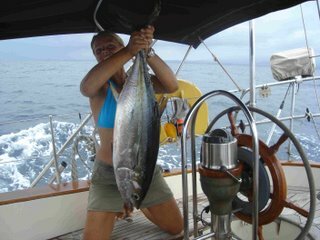 All the fresh tuna has now been eaten -2 meals a day for 3 days and all that is left is frozen ie the other half of the fish. I'm secretly hoping for a menu change tomorrow. We also have a whole stalk of bananas on board which is hanging outside and ripening rapidly. Tonight Carolyn is preparing a delicious banana crumble for supper. If anyone has any recipes for tuna with bananas let us know. Best get back to the sailing as Sandy,Joan and Warwick are hot on our tail on Zefferin with Will and Alyssa on Ragtime not far behind either. Matt and Togs on Helene are planning to leave Isabella on Saturday and we should all be arriving in the Marquesas about three weeks from now.